Game Collect the Gift in style cut off a cord. Action occurs at factory of manufacture of toys. 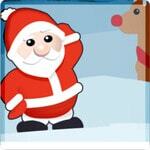 It is necessary to solve all puzzles so that all gifts have got directly to a box to the Grandfather to the Frost.